2016 has been another exciting year for the Reaching Your Dream Foundation. Our biggest accomplishment was providing financial and personal development support to over 50 domestic and international male and female racquetball players to become successful in the sport and life. Also, we launched our Fitness Forever Program in partnership with John Ellis’ Pro Racquetball Academy and the In-Shape Athletic Clubs in the Stockton area. The Fitness Forever Program provides health, fitness, and education services to youth and families in under-served communities. The program teaches sports, health, and life skills in a fun, yet structured setting. Both programs build on our guiding principle: mentor supported players and youth to be successful both on and off the courts. In 2017, RYDF plans to expand both programs: assist emerging pro-level players and further engage under-served young people in the greater Stockton area and other locations, with help from supporters and donors like you. I moved to Stockton from Hawaii in October 2013 to play on the pro tour. Once there, John Ellis asked if I would help out one night a week with a few of the kids in the Fitness Forever / Stockton Juniors Program. I felt it was a good chance to get involved in the local racquetball community. When I started, we averaged 8-12 kids a night. Over the last few years, the program has steadily grown with more and more kids joining our classes. Today, 30 children per night participate three nights a week, with new attendees continuing to join. The program brings kids of all ages and backgrounds together. Everyone from beginners to Junior National Champs works hard to learn and improve all parts of their game. 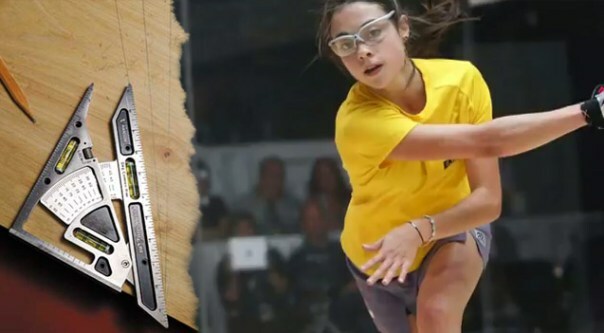 Most importantly, racquetball is a positive influence in their lives, giving them a place to stay away from getting involved with drugs and violence, and also staying focused on doing well in school. Being a coach in the Fitness Forever program through the Reaching Your Dream Foundation has been an invaluable experience for me. I’ve been fortunate to grow as a coach and player under the guidance of some of the best coaches in the sport such as former IRT pro John Ellis, current US Team coach Dave Ellis, and present Junior US Team coach Jody Nance. While the Reaching Your Dream Foundation directly supports my goals on the pro tour, the Fitness Forever program helps me pay it forward to the next generation of racquetball players. Whether the mission is to be a Junior National Champion or just to improve their backhand, it is a blessing to help these kids reach their goals. For us at the Reaching Your Dream Foundation, this first year has been a time filled with intimately learning the struggles young professional racquetball players face trying to make racquetball a life endeavor. The major goal of our foundation is to grow racquetball, and within that context, identify and raise the resources needed to address the unmet needs of players from diverse cultural and socio-economic backgrounds. Throughout this year, we’ve engaged with many organizations and individuals to try and identify opportunities to enable players to pursue professional racquetball. However, our main operational strategy to date, to address the needs of these players, has been to help the World Racquetball Tour, in part, with their mission to facilitate a professional environment for young aspirational racquetball players. RYDF has provided support for players logistically with travel expenses and working to try and develop actionable engagement that help players make the most of their experiences on tour. Our dedicated board most of which are from the Bay Area and who I will talk about in a later entry, worked bring the WRT to ClubSport in Pleasanton, California this past February. It was an endeavor to provide RYDF players another opportunity to compete for prize money, while allowing the local community to see and enjoy the players the community support. One of the young players who came to Pleasanton was Mario Mercado age 19 from Bolivia. Mario is the 2013 Word Junior Champion. Mario had recently made the decision to leave Bolivia and play for Columbia. His decision found him with a few months of “free time”. He decided to stay in the Bay Area and was graciously taken in by a number of families, most of whom were board members of the foundation. While in the Bay Area, Mario was closely befriended and mentored by Bobby Horn from Stockton, California and Carla Munoz of Chile, both RYDF supported players. Bobby plays primarily at WRT tour stops and Carla is a regular on the LPRT. Both train and teach racquetball to children and adults at ClubSport Pleasanton. Bobby and Carla spent a good amount of time with Mario working on his racquetball game as well as his cultural adjustment here in the States. The mentoring Mario received was closely supervised by Pablo Fajre. 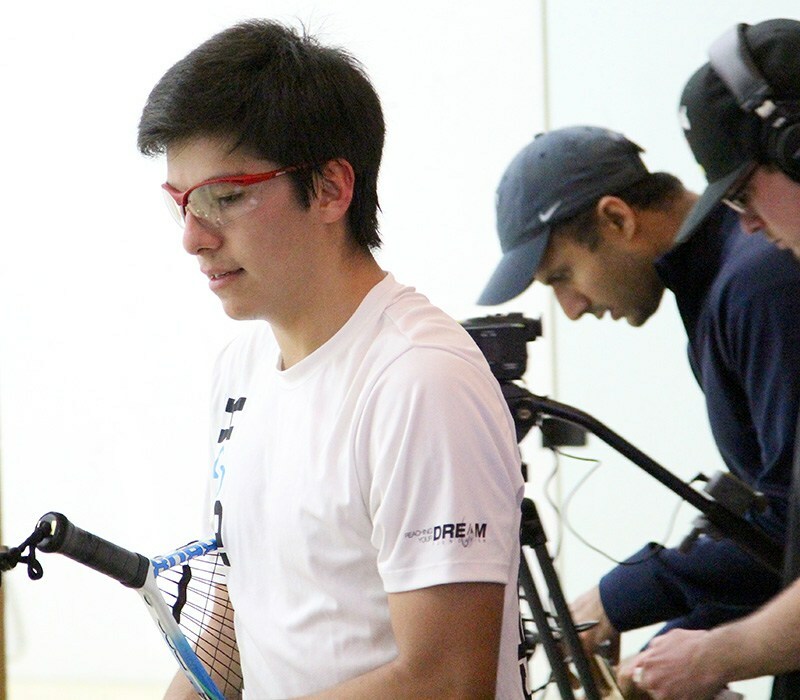 Pablo is the coach of the Chilean Racquetball Team and president of the World Racquetball Tour. Also involved in oversight was Carlos Contreras, a Columbian born player who now lives and plays in the United States and is a citizen of the USA. Carlos is also the Treasurer and accountant for the RYDF. Although all of these machinations dealt with the specifics of one player, it provided a good opportunity to explore educational opportunities and possible partnerships for players like Mario. The leadership of the foundation in conjunction with Pablo and Carlos decided to meet with some administrators of Las Positas College. We met with the Dean of Athletics and the Coordinator of the International Students Program to discuss the more general issue of understanding what is involved with assisting non-USA citizens with their desire to live, learn, train, and play high level professional racquetball in the United States, specifically (for now,) the Bay Area. We are finding that there is much to learn and we feel very encouraged by our experience with Mario. The Reaching Your Dream Foundation has a mission of providing opportunities for players while facilitating growth for racquetball. Right now, we envisioned the Bay Area becoming a major training and education center for both American and non-American, young, elite racquetball players. We are currently learning that moving forward with our mission often involves investing in our players one at a time. Becoming a successful racquetball pro requires the proper mental attitude. Above all, there needs to be a totalappreciation for the precision involved. At the highest level, it is a game of inches. An inch or two on the front wall target will separate a successful drive serve from one that comes off the back wall for a set up. Inches to the right or to the left can make the difference between a successful passing shot and one that is hit at an angle that will bring the ball to where the opponent is located. A couple of inches can make the difference between a perfect ceiling ball and one that comes off the back wall. Those players that think they can win by just hitting the ball harder or by thinking they can get everything, do not see the importance of the necessary precision. Sure, power at the proper moment and retrieving are important. To become a successful pro, the importance of shot precision must be must exist in the mind of the player to an extent that he/she is totally self-demanding. 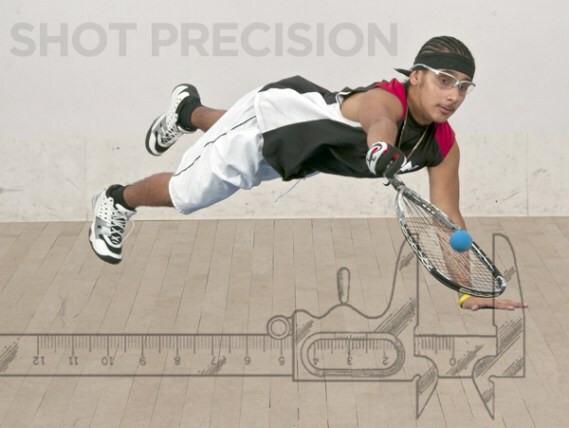 In racquetball we can isolate “angle” and “power.” Both are critical, but our prospective professional must understand that angle is the more important. A very simple but important exercise is to place an object on the floor, moving it to different places all over the court. Our player should work hard to gain command of front wall targets by dropping and hitting from many different places on the court, attempting to direct the shot towards the object. The angles need to be instinctive, and can actually be constructed geometrically. After the drop and hit practice, move on to direct feeds and feeds off the back wall. The cross court angles must be mastered. If a cross court shot is hit too sharply, it comes off the side wall to center court. If the cross court shot is hit too directly, it will pass through center court. Both errors offer your opponent a chance to end the rally with a straight in kill or pass shot. Poorly executed down the line shots hit the side wall and come to center court, again for set ups. Another valuable exercise is to place an object on the floor that can represent the position of an opponent. Our pro can practice hitting shots that are directed away from the opponent. Of course, here again, “angle” is of critical importance.